There are a lot of ways to abuse a crane. We won’t go into those, but let’s do take a minute on crane failures and what they look like. In general, there are 3 main gantry crane failure modes. Let’s look at them, then discuss contributors and solutions to make your crane more robust. A quick way to think about it is the difference between a “Failure” and a “Failure Mode”. A Failure is anytime something breaks, or doesn’t carry out the job. The Failure Mode, is a way of categorizing failures based on what or how it fails. For this discussion on Gantry Crane Failure Modes, we’ll think about three: 1. Failure of the top beam; 2. Failure of the legs; 3. Failure of the lifting apparatus(s). We’ll also talk about Contributors and Solutions to avoid the a crane catastrophe. This is sometimes called top beam folding. I found this image online at: The Practical Machinist. 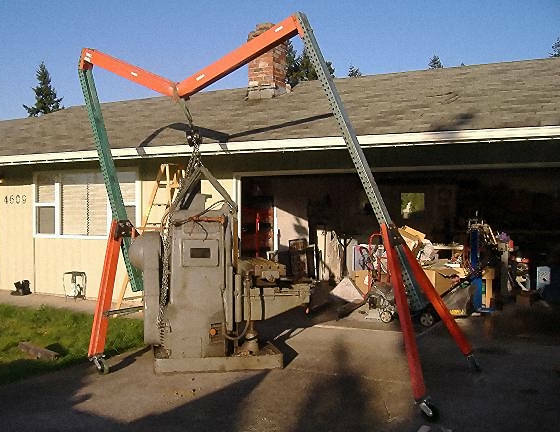 Don’t know much about it, but I think it’s awesome as a DIY crane gone wrong. The crane construction is a nice idea in some respects, and it probably serves well for light things, but this time it’s a bit too far. Classic gantry crane failure. Note how the top beam folded very tightly around the lift strap. Also, how the bending of the top beam then overstressed and bent the top portion of the vertical leg. This is a perfect example of exceeding the top beam capacity. I’m glad are no injuries. Things that contribute to this kind of failure include these. Solutions to make it better are also in the discussion. Beam Load Limits. Yes, this is the obvious point, the load exceeds the limits, but that IS the point. Know your limits, and stay well under them. For a DIY crane like this, you might have to calculate the limits, and if you can’t and don’t have a friend that can, then don’t build the crane. Point Loading. When there is only on strap or chain around a top beam, there are (in engineering speak) stress risers at that point. Simply spreading out the load — like using a trolley — reduces the stress at any one place. As a DIY hack, just put a chunk of wood, a 2×6 or something, on top of the beam, under the strap. It won’t compensate for overloading the beam, but it will spread the load significantly. Beam Type. Some beam types are just better for carrying horizontal loads. Thin-ish wall tubes like these hold lots of weight — when the weight is spread out and the ends are stable (see below). But, an I-Beam is much more suited. Please read the article on beam shapes. Beam Size. In simple terms, the taller the beam, the more it carries. If you double the vertical dimension, you basically 4x the load capacity of the top beam. (Don’t quote that number, because it’s a generalization.) That’s not really true for the legs, but in a horizontal bending condition, taller is better. Read the article on increasing load capacity for more perspective. Proper Beam End Support. We’ll talk about this more later, but it is definitely a contributor. There are a two ways a crane leg will typically fail. Usually for a gantry crane, the failure occurs because the top of the leg doesn’t stay directly over the bottom. (Think straight up and down.) And, that is evident in the first photo above. 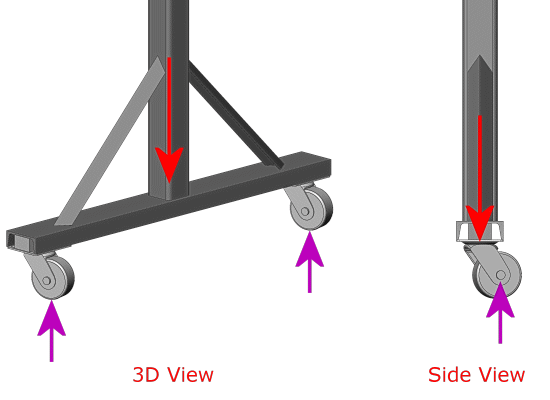 When something happens to wiggle the top beam or move it somehow — either by a swinging load, or someone trying to drag it on it’s casters, or some other condition — the load in the leg becomes less than axial, and often that leads to failure. For example, in the crane failure photo above, the folding of the main beam pulled the legs (both) inward, and put a huge bending moment at the leg tops. The relief of all that stress came when the top of the one leg also failed (bent). The second, much less frequent failure is column buckling of the legs. That means the leg becomes over stressed and collapses. Most times that’s a bowing out and buckling of the leg, but on rare occasions it’s a collapse like stepping on a soda can. To be complete, a third type of leg failure is when the gantry is on a track, and the track supports fail. A concrete wall, for instance, but we won’t go into that. Leg failures are less common than top beam gantry crane failures. However, as noted above in #5 above, legs that are not well supporting contribute to the top beam folding. Either way, it’s a gantry crane failure. Remember the weakest link — if the legs are weaker than the top beam, they’ll fail first. Here are some things that can cause this, along with solutions. Stiff Legs. Truly, the top beam is up there high, and only the stiffness of the legs keep in place. We frequently see legs that are braced perpendicular to the top beam, but not very often do we see them braced parallel to the main beam. If you think about strong shapes, an open rectangle is not very strong except when the legs are perfectly vertical. That gives emphasis to the need for stiff legs, and . . . Stiff Connections. 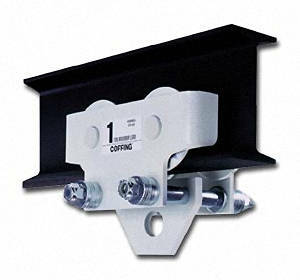 Related, to the above, beam connections are a critical area. A stiff leg easily becomes much stiffer when gussets to the main beam are incorporated. The gantry crane failure above as well as this crane shown (Cap 3 Tons) both illustrate a lack of gusset. Any side to side wobbling of the crane — even just pulling on one side to move it when loaded — can cause the joint to fail. High Forces. Even when the materials are super strong, we can’t forget that these materials are under massive stress. And, if it’s anywhere near the limit, just a little more in the wrong direction can bring it all tumbling down. Youtube is full of examples. Crane is on sloping or uneven ground. See Unsure Footing below. Wheels. This point is in it’s own section below. Dynamic Loads. Any load that moves around on the crane is potentially a contribution to failure. This includes swinging loads, bouncing loads, attempts at moving a crane by pulling on one leg (thereby splaying the legs). Swinging loads should be obvious. Bouncing loads . . . the top beam is a very stiff spring. If your load is “dropped” slightly — even if it’s just the popping movement of a chain or hook or cable — can cause the load to bounce. That puts extremely high forces on the system. I’m not sure how to label this one, but basically it means things are not straight and true. For instance, using a gantry crane on a sloped driveway — the loads don’t go straight down through the legs. The legs then carry a bending load too, so the total vertical load capacity is drastically less. Another example is when the feet are not sitting parallel, creating a twist on the top beam. How you place the crane matters. Another aspect of sure footing is the security of the leg position. To that end, we have a whole section about wheels. Wheels: Why We Love Them, & Why We Might Hate Them. Nearly all Gantry Cranes have some type of mobility. On smaller cranes wheels are nearly universal, and why not, it’s so much better for crane positioning and/or moving the load. However, they drastically decrease the load holding capacity of the vertical legs. No, not because of the wheel capacity, but because they don’t give a stable platform for the crane. Think about the crane leg setting flat on the ground. Think of it as the “T”, upside down with two large gussets supporting it. That’s typical of a small gantry. See the image. Vectors in these images show the major forces. Red arrows show force down through the leg from the top beam. Purple arrows show the forces supporting the crane (from the ground). The legs in this first simple case will not roll or slip or otherwise move when a significant load is on it. It also directs the vertical loads coming down the leg directly into the ground. Because the bottom is flat, it’s perfectly happy standing there straight up. Compare that to the same crane let, but with casters added. Forces are basically the same, except they also pass through the added wheels. Of course, these wheels are plenty strong, that’s not the issue. Wheels naturally want to roll, so only a little force will cause them to do it. The load coming directly down the leg is NOT straight into the ground — it’s offset by the caster distance. (In the side view.) That means the leg naturally wants to tip over. More explicitly, it wants to start tipping then roll out and fall. It’s only because of the joint strength at the TOP (where the leg connects to the gantry beam) that the legs stay vertical. These legs definitely will not naturally stand up on their own. In engineering speak, we refer to legs with wheels as having additional degrees of freedom. The leg is NOT solidly planted, so movement must be accounted for. Having wheels on the legs allows the legs to more easily move or bend, which puts a lot more stress at the top beam joint. If you must use casters, make sure you overdesign the legs and especially the joints, to take lots of additional stress. Even if you orient the wheels so the leg forces are planar, if you move the crane, they will caster. If you won’t be moving the crane when loaded, why have the wheels? We often think of the Gantry Crane by itself, the legs and the overhead cross beam. Those by themselves don’t often fail — unless there is something attached — the load — which is held by auxiliary equipment. The lifting equipment is the 3rd gantry crane failure mode. We won’t spend a lot of time here, but there are trolleys, straps, chains, cables, hooks, winches, gears, levers, come-alongs, pulleys and a host of other things that can lift the load. How they connect to the crane is crucial (as mentioned above), but also their own capacity and the interaction of you with these devices. Make sure auxiliary equipment is rated for the loads, and make sure you know the weakest link. If you think some of these gantry crane failure modes are weird, please think about stressing things near their limit. It doesn’t take much to push them over the edge. Unfortunately, they don’t usually give much warning. The best practice is always to respect the crane and other lifting equipment. By respect, I mean don’t push it to the limits, and follow the practical safety measures. Just don’t do it, because in a fraction of a second you may destroy your work at a minimum, or totally change your life at the worst. It’s just not worth it. Disaster strikes in seconds, like in this gantry crane accident. It is always interesting to me as an engineer as I consult with people about failures. Forensics, as we call it, is really figuring out what happened and why things die (fail). Not very often is it just one thing. Normally it’s a series of things that create the final problem. 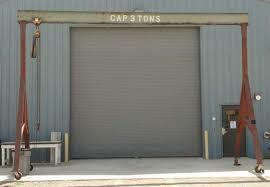 Looking at the small crane image above (the one that says Cap 3 Tons). I can see this one ready for problems just because there are several small things biasing a reduced capacity. First, the wheels make it so the legs are not secure at the bottom. Second, the beam is pretty high. Longer legs = lower capacity. 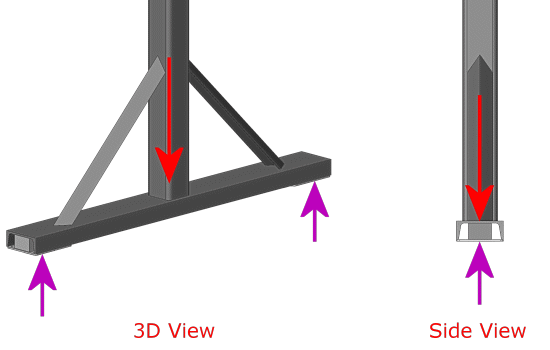 Third, the top joints where the gantry beam connects to the legs is not very solid. There is not a gusset there to stiffen that joint. A Scenario: So, the crane is placed and a full 6000 lb load is lifted with the chain fall. Then one of the guys grabs a leg and pulls on it hard to the side to move the crane. That introduces motion, but the inertia of the load doesn’t immediately move. In a second, the load starts to swing on the crane, which makes it easier for the guy to pull the leg (while the load is swinging his direction), so he pulls more. The load then starts swinging in the opposite direction, with the guy still pulling on the leg, and suddenly the legs splay and it all comes crashing down. There are no serious injuries, but the the splaying leg undercuts the guy pulling the crane. It’s not one thing, it’s a combination of things. First, make sure the design of the crane far exceeds the max load. The max load should be a fraction of the true calculated max. Second, make the joints rigid with gussets or other mechanics. Third, set the crane on the ground when lifting. Use other, safer methods to move the load around. Things like a cart are much safer. Fourth, if you must move a loaded crane with wheels, connect the feet with a rigid bar. It can clamp on, but this will avoid having the legs splay. Fifth, do your absolute best to avoid load dynamics like bouncing or swinging. The gantry crane is a system, and gantry crane failure is never out of the question. Just be smart, and the likelihood of you being an eye witness of such a failure goes way down. 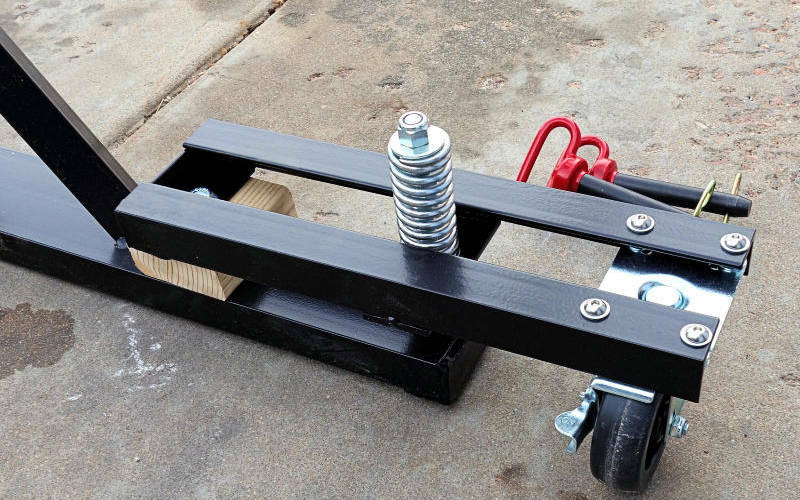 What materials should I use for building my trailer frame? It’s a common question with strong biases for Rectangular Tube or I-Beam or C-Channel. Also, choices of Aluminum versus Steel.